I have never felt the gears of social change churn as powerfully as they did on that sweltering June day in Phoenix. The Bernie Sanders campaign invited me to testify before the Platform Committee of the Democratic National Convention on behalf of a climate solution I call Carbon Price and Rebate. To win this solution, at 23 I launched a grassroots organization in my home state of Oregon that is now a national campaign. That day in Phoenix I would strive to inject it into the lifeblood of the Democratic party. The committee peppered me with questions. Rep. Barbara Lee asked what it would take for young, diverse voters to become Democrats. I said we need leaders who answer to the demands of justice and science, not political convenience. “Have courage,” I pleaded. People say putting a price on carbon is impossible in the current political context. Nelson Mandela said “it’s always impossible until it’s done.” If the Bernie Sanders campaign has proven anything, it is that organizing changes politics — and that there is real power in calling for the solution by name. This is a tremendous first step, but it is only half of the solution. The other half addresses the question of what happens to the extra money we pay for carbon-based fuels. Will it go in large part to historic polluters, as in the bill that failed to pass the Senate in 2010? Will it go to corporations and wealthy individuals in the form of tax cuts? Will it go for government spending? Or will it go back to the people who co-inherit the air and are the ones who will ultimately pay when carbon prices rise? This is a crucial question because the last try at carbon pricing was a sprawling bill, known as Waxman-Markey, which would have capped carbon, auctioned some but not all of the permits, and used the auction revenues for a multitude of purposes. The 1,200-page bill was so complex no one could explain it. It was designed to deliver pork to large stakeholders and loopholes to intransigent polluters. The climate, and the public, ultimately took a backseat. Another approach, cap-and-dividend, was also on the table. A bill by Rep. Chris van Hollen, soon to be a Senator from Maryland, was only a digestible 25 pages long. People understood that approach: enforce an ever-strengthening limit on pollution, and return the permit revenue to every American as a dividend. But Waxman-Markey pushed cap-and-dividend aside. Seven years have passed. The reality of climate chaos, and the expert consensus to price greenhouse gas pollution, have only intensified. It is time to recommit to this solution. Young climate leaders have learned their lesson. With a new design and a new constituency comes a new politics that can win. Our idea is simple: Make polluters pay, and return the proceeds to every American equally, one person one share. Everyone needs a healthy planet, everyone will need to chip in to save it, and everyone deserves and needs some extra income in these difficult economic times. Linking a carbon price to rebates or dividends is the democratic solution. It is the one you can organize around, ignite the Bernie/Obama momentum, and make everyone a stakeholder. The orthodox view, that carbon revenue should be allocated to polluters, corporations and government programs, cannot create the public support that is necessary for climate pollution prices to rise not only once, but steadily for several decades. The reason more people don’t get fired up to fight climate change is not apathy, but cynicism. People want to get involved in a winnable fight, and don’t know what could really work. This equitable carbon rebate solution will not only drive down pollution without a large administrative apparatus; it will also make our middle class more secure and promote racial justice. The middle class has been losing ground for over 20 years. Our wages have been falling (in real terms), while our costs and debts have risen. Globalization, automation and financialization have brought these changes on, with no end in sight. The only solution is some income for Americans above and beyond wages. In addition, studies show that a carbon price and rebate provides the highest benefit to Latino, African American and Asian households. This is only fair, since communities of color and low-income families have contributed the least to climate disruption but too often bear the greatest cost. I have worked on climate solutions for 11 years, ever since I mapped my lifetime onto the hockey stick of temperature and wondered how the world would be safe enough to have children. My college climate club was the largest on campus. It’s no accident that mine is the generation that backed Bernie Sanders, champion of the carbon tax plank, by a ratio of seven to one. We need our next President to make polluters pay every one of us for the harm they’re causing to ourselves, our children, and the planet. 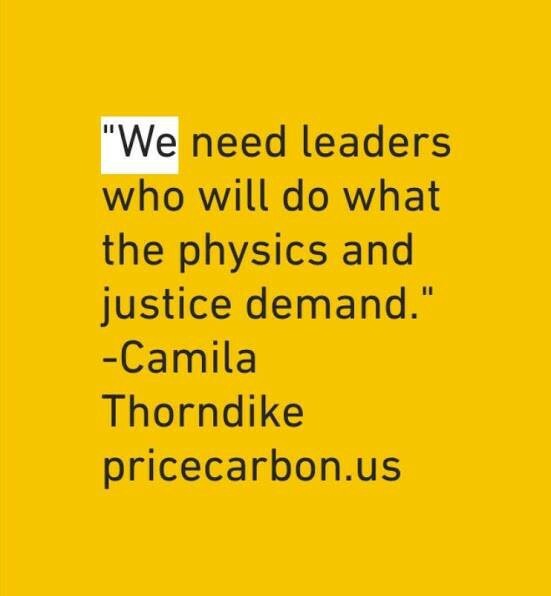 Camila Thorndike is co-director of the Put A Price On It campaign, co-founder of Oregon Climate, and Carbon Pricing Coordinator for the Chesapeake Climate Action Network (CCAN). She has advanced climate action in California, Oregon, Washington, Arizona, New Mexico, North Carolina and D.C.